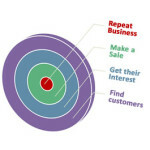 Keeping customers, and generating repeat business, is just as important as finding new customers and making that first sale. A Taylor’d Design can recommend best practices to find and keep customers. Contact us for a free assessment and recommendations for setting up your customer programs.